Dazzling costumes and pulsating rhythms-the heat, energy and fervor of Trinidad’s Carnival will sweep you up in its frenzied pageantry. It’s one of the top three pre-Lenten celebrations in the world (New Orleans’ Mardi Gras and Rio de Janeiro’s Carnival are its closest rivals) but Trinidad’s festivities are more culturally diverse and all-inclusive, allowing anyone and everyone to jump up and join the party. Things begin to heat up after Christmas and culminate in a mad week of competitions, concerts, fetes, parades and general bacchanal (mayhem) leading up to the grand Parade of Bands. The festivities abruptly end at midnight on Ash Wednesday, the beginning of Lent, which this year falls on February 28, 2001. Lent, the Christian season of soul-searching and repentance, originated in the earliest days of the Church as a preparatory time for Easter, when the faithful rededicate themselves and the converts prepare for baptism. By observing the forty days of Lent, Christians imitate Jesus’ withdrawal into the wilderness for forty days. In many countries around the world, the last days before Lent have become a time to indulge in a last fling before the solemnity of Lent (Mardi Gras, Shrove Tuesday, Carnival, Carnevale in Italy, or Fasching in Germany). It’s customary to do acts of penance, to fast and to abstain from meat during Lent, which led to the name Carnival, derived from the Latin for “farewell to meat.” The tradition of celebrating during the days before Lent goes back at least to medieval times, when many European kings and lords knighted young men and held feasts in their honor. Trinidad is the most southeastern island in the Caribbean chain, located just miles off the coast of Venezuela. It has been settled and ruled by the British, French and Spanish and its racial mix is comprised of nearly 40 percent of the population tracing their roots to Africa (via slavery), 40 percent of East Indian heritage (originally brought in as an indentured labor force) and 20 percent “other” including descendants of the European colonizers, Chinese immigrants, as well as people of Amer-Indian and South American descent. The country’s artistic heritage draws from this diverse history to create a unique cross-cultural blend. “Mas” (short for masquerade) originated from the French aristocracy who briefly ruled in Trinidad at the end of the 18th century. They developed their Carnival season of elegant festivities extending from Christmas to Ash Wednesday-dinners, balls, hunting parties and fete charnpretres. Leading members of society would dress up, wears masks in disguise and drive through the streets in their carriages. In the evenings, on foot and accompanied by bands of musicians, they would visit friends who had declared “open house” for the occasion. These celebrations were adopted and adapted by the African slave population, who imitated the slave owners’ customs but also added their drumming, dancing, spiritual rituals and costuming to the mix. After the slaves were freed in 1838, the festivities exploded into massive celebrations of “canboulay” (from the French cannes brulees, the burning of the cane on the sugar plantations), which took place after midnight on Dimanche Gras, the Sunday before Carnival. This vibrant and popular new Carnival on the streets jolted the gentry, who stopped participating, instead maintaining their disguised balls and fetes. The growing middle class threw itself with zest into house-to-house visiting, and as time went by, participated more in the “Road Mas” of the people. Authorities unsuccessfully tried to curb Carnival during the Victorian era, which led to rioting. The dawn of the 20th century saw a revival of masquerade, and out of Trinidad’s wide range of cultural influences has grown the multifaceted aspects of today’s celebrations, along with Carnival’s status as a vital and legitimate cultural event. Nearly everything associated with Carnival has become a competition-from the best costumes to the best song, from to the best party to the best steel band-and the various rivalries are watched, judged, commented on and fiercely yet good-humoredly challenged. The music of Trinidad is calypso-it’s the country’s most eloquent and all pervasive form of expression-and it’s heard everywhere. During Carnival, the latest calypso songs are played endlessly, and the calypsonians perform before judges in competitions leading up to the National Calypso Monarch Competition, where they go head-to-head for the title. There are many different styles of calypso: chanted socio-political commentary and satire, witty and entertaining love songs, as well as the sometimes highly suggestive dance tunes. Another extraordinary Trinidadian art form is the steel pan, invented around World War II in the back alleys of Port of Spain. Discarded oil drums were hammered into musical instruments, and musicians banded together in pan-yards to create percussive orchestras. While they were at first considered disreputable, the popularity of steel pan grew until it became the official music of the roadmarch. The Panorama competition during Carnival is a vibrant event, with energetic steel bands consisting of more than 100 members dancing and playing songs ranging from thunderous pop tunes to chiming, classical compositions. 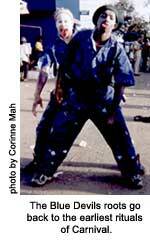 Soca (from “soul-calypso”) has developed over the last few decades and is now the dominant form of music in Trinidad. Soca’s roots are the African drumbeat, but its modern electronic sound has R&B, reggae, Euro-pop, Indian and even Chinese musical influences, at times. The relentless, churning beat of soca anchors the Carnival roadmarch, and the year’s best tunes become ingrained in one’s memory as they are played over and over. Of course, the artists and their songs compete for the Soca Monarch, Ragga-Soca, and Roadmarch titles. 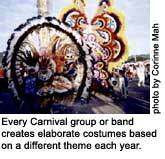 The most famous aspect of Carnival is the fancy Mas, the official Parade of Bands on Shrove Tuesday. People join different bands (groups), depending on what theme or costumes or musical accompaniment is provided. It’s customary to tour the various “Mas camps,” where the costumes are made, to choose a band to join to “play Mas.” Today, many of the bands are on the internet, so you can shop and sign up on the web. Beginning at 9 a.m. Tuesday, at the main judging Grandstand on the Savannah, the route winds its way throughout the downtown streets of Port of Spain. The parade is incredibly vast, consisting of dozens of bands each comprised of hundreds and sometimes many thousands of costumed revelers. Huge rolling sound systems and live musicians blast the latest tunes and are followed by waves of dancers, their colorful finery flashing as they step-march and dance down the road. But there are other parades as well. The official start to Mas is J’Ouvert (pronounced joo-vay), which begins at 4 a.m. on Carnival Monday. It is a wild, uninhibited celebration also known as “Mud Mas” because the players smear themselves with mud, body paint, oil, or even chocolate sauce, dancing and “wining” (writhing) through the dark streets. The party continues into the morning, when the first Parade of Bands begins. You can also join a nighttime band on Monday evening. 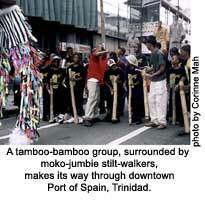 If you prefer a more historical parade, the “Old Time Carnival” features traditionally styled costumes that include Old Time Sailors, moko jumbies (stilt-walkers) and the mystically wicked Blue Devils or djab-djabs (from the French word diables), accompanied by the original percussive parade music of tamboo-bamboo. One of the most charming sights is the Junior Parade of Bands (or Kiddies’ Carnival) that showcases children’s groups dressed in the more traditional folkloric costumes. Outlying areas also host their own festivities and parades. It’s intense and can be overwhelming, but Trinidad’s Carnival provides entertainment and excitement unlike anything else on earth. For an updated listing of what’s happening at this year’s Carnival, go to http://www.guardian.co.tt/carnivalindex.html or see below. PLAY DE PAN AND DE MAS!